If you’re one of those dog owners who cannot resist an opportunity to dress up your pet, there are opportunities all year long. Dress Up Your Pets Day, Halloween and any other excuse will work for most of us! Now you could just go to the store and buy your dog an already made doggie costume, but why not try getting creative with it? We always encourage everyone to dress up their pets responsibly. If your dog is not into wearing a costume, it’s better to let your dog be happy and enjoy photos of other dogs in costumes. You’ll want to make sure that the costume you pick for your dog does not limit vision or mobility. It’s best to get your photos and then take the costume off your dog. Never leave a dog unattended in a costume. It could be dangerous. 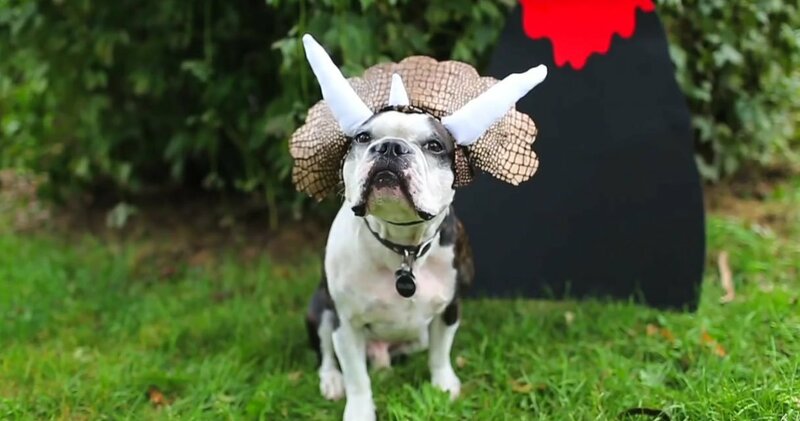 With that said, here are 10 easy to follow video tutorials of DIY dog costumes that just about anybody can make. This DIY tutorial is perfect for those of you obsessed with emojis, which, let’s face it, is pretty much everyone these days. This specific tutorial features the pizza and taco emoji, turning your precious dogs into adorable food emojis. All you will need is a variety of felts in different colors, a hot glue gun, and a dog harness. These costumes are sure to get people’s attention. For this cute and budget friendly costume all you need is a stuffed animal of your choosing, a dog harness, a strip of Velcro, scissors, and a glue gun. Don’t bother spending much money on the stuffed animal because part of this costume involves cutting out all the stuffing and cutting out the face. You can pick up a stuffed animal at just about any thrift store for a buck or two. Once you slip your dog into the stuffed animal you won’t be able to stop smiling. This will definitely make for an Instagram worthy picture. At the moment this is the perfect costume since Star Wars is all the rage. Join in on the Star Wars spirit with this adorable homemade DIY Ewok costume. With just a couple stitches you will have yourself your very own doggie ewok. Who knows, maybe your pup will be dressed so well J.J. Abrams will cast her in the next movie, you never know. Cross your fingers! Minions are everywhere and there is no stopping their takeover, not even in the form of a dog costume! This is probably one of the funniest costumes you can put your dog in, that’s for sure. This costume is a bit more complicated to construct, but if you follow the video tutorial and are a determined crafter you are sure to have no problem. The end product is definitely worth the effort in this case. This is a super simple costume that involves no sewing whatsoever. All you need is a pillow pet and a pair of scissors. Just cut out the stuffing and make a hole in the face and you’re done. Your dog will especially enjoy how comfortable and soft this costume is. For this particular tutorial they chose a butterfly, but you can buy any animal pillow pet and turn it into a costume in the exact same way. This costume however is probably best for a smaller dog just because pillow pets don’t come in any bigger sizes. This video features a variety of costumes such as Yoda, a pirate, a dinosaur, and chia pet. Each of the costumes require only a few items that can easily be bought at any craft store. The chia pet costume is one of the more creative costumes out there, but you might have to explain to your friends that your dog is not dressed up as a giant bush. If you are super artsy definitely try these costumes because they require a bit more creative skill. This is an adorable way to turn your dog into a skunk for a day, but without the stink part. You’ll need a little dog t-shirt but that’s the only part not handmade. The rest is with the magic of felt, faux fur, and a glue gun. This costume is sure to turn heads! E.T. is such an iconic character that the minute you put your dog in this costume, everyone will instantly recognize him. This costume actually requires you to dress up alongside your dog, with your dog dressed as E.T. and you dressed as Elliot. All your pup needs to do is get into a basket and put on a blanket, and there you have it. This costume is actually more complicated for you than your dog. This is by far the best costume for any small high energy dogs out there. Jack Russell Terriers , Chihuahuas, and Dachshunds will definitely fit the personality of an energy drink. It’s perfect for you pint size pup. The peacock is such a gorgeous animal with its beautiful feather patterns that it definitely makes for an ideal costume. This DIY requires no sewing, just some scissors and felt. Do you dress your dog up?